Hey! Manchester is delighted to be curating a stage at this year’s Sounds From The Other City – our tenth year in a row! SFTOC is a one-day music festival that celebrates the diversity of Greater Manchester’s ‘other city’. The 12-hour event places many of the city’s favourite promoters – including Now Wave, Comfortable on A Tightrope, Grey Lantern, Fat Out, The Beauty Witch and Bad Uncle – into several of our favourite venues and drinking establishments along Chapel Street. Hey! 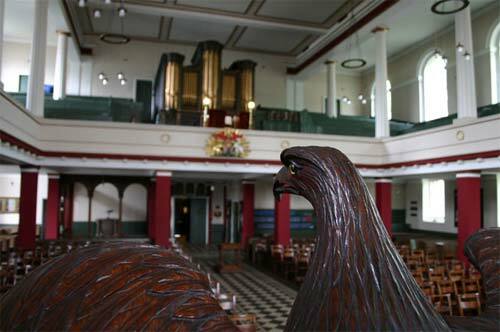 Manchester is excited to be returning to a very special venue: St Philip’s Church. The building is one of Greater Manchester’s finest Georgian buildings, dating back to 1825, and its Greek style is unique in Salford. To check out who else is playing Sounds From The Other City 2018, visit the soundsfromtheothercity.com. Tickets, giving access to all stages, are available in person from Siop Shop, Common, Piccadilly Records and Font Chorlton, and online via Skiddle.